For this reason, we have updated all our software that connects to or otherwise interacts with Office 365. To avoid possible issues in the future, we recommend that you update your software to the latest version. Make sure to update your CodeTwo software as soon as possible. 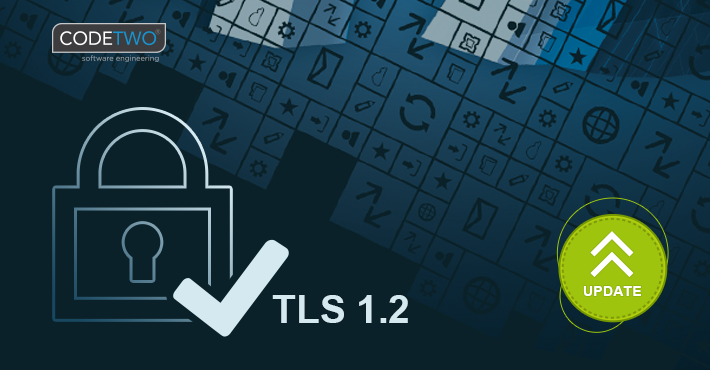 With the new TLS protocol in place, the updated CodeTwo products will provide a more enhanced level of encryption, significantly improving the security of your data. To update a specific program, use the links below to download its newest version. Then simply close the program, if its still running, and install the update on top of your current installation (don’t worry, your settings and/or the progress of running jobs will not be affected in any way). CodeTwo Exchange Rules and CodeTwo Exchange Rules Pro should be updated only if you use it in hybrid environments together with the software’s Sent Items Update feature, or when you use the Unsubscribe feature in Pro (all environments). If you are using CodeTwo Email Signatures for Office 365, no action is required from your side. Keep in mind that the updates are always free of charge for all licensed users.